I'm doing something a bit different today. I'm writing a book review... with a treat. Stick with the review and you could win a copy (details below)! The Pacific Crest Trail, or PCT, has been everywhere lately. A high school friend's parents just hiked sections of it and their lovely photos have been dotting Facebook. I heard about bear canisters and resupplying and blisters galore! Many of my friends have been reading Wild by Cheryl Strayed and photos of her book (about the same hike) have been populating my Instagram feed. And then, I was selected to participate in this book review and lo and behold, the PCT rears its fascinatingly terrifying head again. 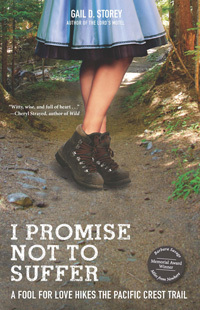 Gail Storey's I Promise Not to Suffer chronicles her attempt at a thru-hike of 2,663 miles of often unforgiving, but always beautiful west-coast wilderness. Gail's hike is prompted by her husband's urging - a former hospice doctor that set out to find himself among the wild after a series of changes in hospice care and his facility caused him to resign. She chooses to accompany him for reasons I found myself instantly sympathetic to: she doesn't want to worry about him for six months, she doesn't want to miss out on an experience to get closer to him, she wants to find herself as well out in the great unknown. What results from Gail's decision to undertake the route, from the start in California on the U.S./Mexico border and through to British Columbia, Canada, is a journey where she comes to terms with her relationship between her husband and herself, her strained relationship with her mother, and her own body (its strengths and its failings). With Gail's own personal reckoning, in I Promise Not to Suffer, there also comes vivid description of the trail, their well-thought out and trail-gourmet meals, and encounters with the most difficult terrain. She and her husband climb achingly tall mountain peaks in the snow, ford swollen and icy rivers, and fear for their lives on many an occasion - sick from drinking un-purified water and fearing frostbite in the snow. One of the things I loved most about this book was that it detailed a journey I will (most likely) never take. Thinking about making the hike that Gail and her husband did fills me with fear and worry, and yet they did embark, hiked 20 miles every single day through treacherous desserts and mountain peaks, and emerged all the stronger and more in tune with themselves. I found the book to be a total page turner as I wanted to join them on each turn in the trail, see them safely bedded down for the night and out of the way of passing bears and mountain lions. I found myself inexplicably drawn into that which I feared - just as Gail found herself drawn into the journey and adventure of the PCT. Interested yet? Win a copy of Gail Storey's I Promise Not to Suffer by following my blog (links on the sidebar) and leaving a comment with a goal that's out of your comfort zone that you'd like to accomplish and the way you follow the blog. The winner will be randomly selected on August 30! Giveaway open to U.S. readers for the physical book, or any readers for a Kindle or ePub file version. I follow you on bloglovin. I guess a goal out of my comfort zone has acutally kinda been a life long goal. I've always wanted to go to England, but the only way to get there is to fly, and I am absolutely terrified of flying. So that's my goal, to fly to England, getting home will be another story. I follow the blog on Feedly now that Google Reader is dead and gone. My goal is actually a hiking one as well - I would love to hike the Wonderland Trail around Rainier with my husband. Less ambitious than the PCT for sure, but still a huge obstacle for unathletic me! The idea of camping for two weeks isn't really within my comfort zone either, but I think the experience would be amazing. This sounds like an amazing book! Definitely one I will read! It seems very interesting book! Thanks for review! great review on the book! always looking for a good read when I go on travel! A goal of mine that is out of my comfort zone is to go sky diving one day! super out of my comfort zone! followed all the entry steps! This book sounds really good, I'm totally going to recommend it for my book club! Congrats and this sounds like a very interesting book!! I'm always on the lookout for books to read. Thanks for the review! This book sounds fascinating but I am not sure I could read it I used to live Pacific Northwest and I had a friend that died rock climbing in Northern California. I think it would hit too close to home. I wish I could read it though. This book sounds great! A must read. My daring goal is to one day bike across the USA with my mom. We will see! That's actually a trail I would love to trek. Living in BC, we hear about it all the time as well. My goal is to open a nonprofit animal shelter one day! I actually conquered one of my biggest fears - heights just two weeks ago. My little brother is Airborne Infantry in the Army, and I have said for 4 years that I cannot fathom how he jumps out of airplanes, so I DID IT. Next on my list is something more physically demanding, I think a 100 mile bike ride with my husband will be in order next spring. The book sounds amazing, and I found myself drawn in just from your detailed review - I am envious that the husband and wife could make that journey together. Maybe I can add the Appalachian to my bucket list? I'd like to push myself out of my comfort zone when I go off to college and try all sorts of activities and clubs that sound interesting! Thanks for your wonderful review of I Promise Not to Suffer--I appreciate it! I especially enjoy hearing the different ways those who are commenting would get out of their own comfort zones. Love your blog, and liked your great suggestion about framing art from books. We have a bird theme in our guest area-- Audubon prints--like you!